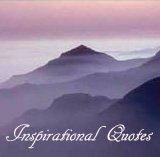 The Churchill quotes you will find here are about subjects such as action, risk, success, victory, democracy, war, stupidity, human qualities, fear, tradition and politics. When you read these quotes you'll realize what a true word magician he was. Not only are many of these quotes by Winston Churchill wise, they are very often also quite funny. With seeming ease, he creates wonderful linguistic paradoxes spiced up with sharp, intelligent sarcasm and typical understated British humor. Read on and dive into the first batch of funny quotes by Winston Churchill. 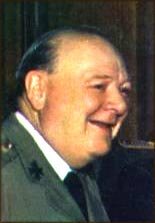 Sir Winston Leonard Spencer-Churchill (1874-1965) is considered one of the greatest leaders of war of all time and is especially known for leading Great Britain through the Second World War in his capacity of Prime Minister from 1940-1945. However, not only was Winston Churchill a strong wartime leader, brilliant writer (he even received the Nobel Prize in Literature), charismatic orator, eager historian and amateur artist, he was also, as mentioned, a great humorist. I think I can save the British Empire from anything - except the British. 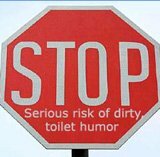 Yes, at once hilariously funny but also pointedly sarcastic. Another way to phrase this great quote by Churchill is mirrored in the famous saying: You are your own worst enemy. 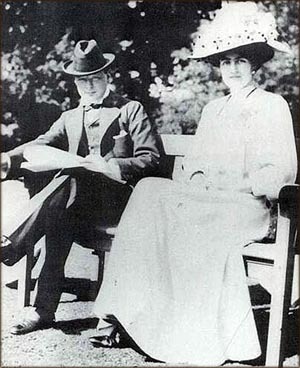 In 1904 Winston Churchill met his future wife, Clementine Hozier for the first time. Four years later in 1908, he met her again and this time he didn't let her get away that easily again. Churchill quickly married Clementine later that same year. A wonderful example of Winston Churchill's famous play with words where he creates funny paradoxes that forces you to stop, sit down, and think. 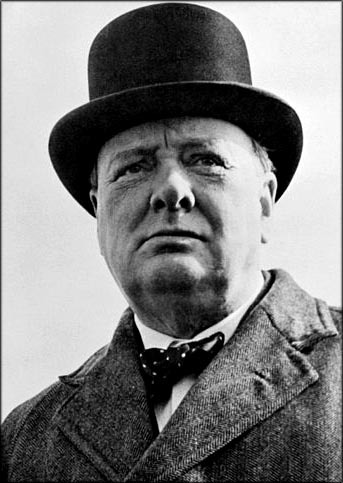 Winston Churchill was not only a sharp intellectual; he was also a man of action. In other words, he was a strong cocktail of both thought and action. One of his many important everyday tasks during the Second World War was to prioritize what needed to be done and when. 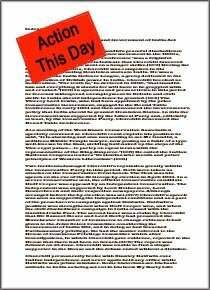 So, when he gave out orders, he made sure to clearly prioritize their importance and the top most important tasks would be 'decorated' with a sharp red label that said "Action This Day". Winston Churchill's ability to inspire and bring hope to the British leaders and citizens was one of his biggest attributes as a wartime leader. His relentless dedication to action and always having a mission naturally infused his personality with the attributes of strong enthusiasm, stubborn perseverance and contagious optimism. I like things to happen; and if they don't happen, I like to make them happen. Better to dare mighty things and fail, than to live in a grey twilight where there is neither victory nor defeat. Even though Winston Churchill was very successful in many of his various political and war related missions, he did also carry out strategies and interventions that lead to failures such as the military offensive in Norway in 1904. However fortunately, Churchill was more of a 'goal' man than a 'being right' man. So if something didn't work or he was proven wrong, he wasn't afraid to eat his own words and strike a new, better course of action. Even though Winston Churchill was a strong, dedicated proponent of democracy, he was not walking around proclaiming his democratic beliefs as a blindfolded fanatic. Being more of an action orientated pragmatist and realist rather than a romantic idealist, Churchill realized that everything, even the seemingly best, has its limits. Democracy is the best form of the worst type of government. Even though Winston Churchill is known as a strong wartime leader, he is by no means a war illusionist painting war with a golden romantic glow. On the contrary he saw war as a necessary evil. So according to Churchill, war is a time of chaos, uncertainty and madness but that was still deemed a better option than surrendering oneself systems and beliefs with which one cannot reconcile. Even though Winston Churchill had his own strong beliefs and moral convictions, he would always strive towards seeing things from above. 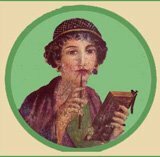 Just as much as he hated passivity and procrastination, he strongly disassociated himself with anything that smelled vaguely of fanaticism. 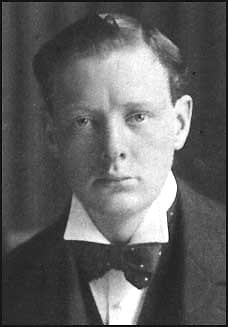 Winston Churchill had a long political career being very active and before and after the First World War. In the 1930s Churchill was out of Government but his increasing worries about Hitler and his continuous appeal to take a more aggressive stance towards Germany let him, among other things, to be accepted as First Lord of the Admiralty in 1939. This was his first step into his most important and memorable years of war politics and in 1940 Winston Churchill became Prime Minister. And it was as Prime Minister and war leader Winston Churchill is considered to have reaped most of his successes and victories: politically of course by winning the war but also as an icon of inspiration, strength and encouragement. 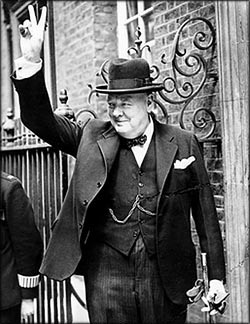 To the right you see Winston Churchill's popular signal of victory, the V-sign. This now classic gesture of both victory and opposition by Winston Churchill quickly became popular worldwide and has since then been used by both warriors and peacemakers alike. 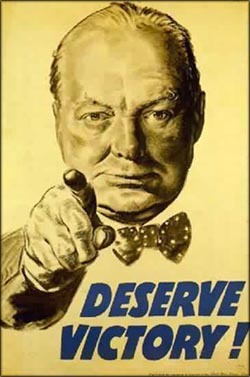 Winston Churchill wasn't always politically successful and was actually responsible for a couple of military failures, however, whatever the specific result of certain political and military endeavors, Churchill was never afraid to make a stand and take action. You can see Winston Churchill as being on a personal mission of doing what he believed was right. And being guided by that torch of 'rightness' made Churchill seem naturally infused with courage and perseverance. Never give in -- never, never, never, never, in nothing great or small, large or petty, never give in except to convictions of honour and good sense. The above courage quote is probably one of Winston Churchill's most famous quotes of all time. It was uttered in a speech he gave at Harrow in 1941 and it worked as great inspiration to keep on fighting for freedom and being optimistic in spite of obvious hardships and challenges. Here Winston Churchill very wisely captures the essence of how fear works. The more you ignore fear or try to run away from it, the more you will feed it and stronger it will grow. However, if you choose to look it in the eyes, you will often realize that there is really not much to fear ... other fear than itself. One of the things that made Winston Churchill such a successful orator and writer was his ability to put his messages into powerful and unforgettable metaphors. 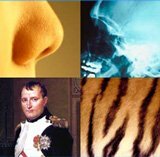 Some of his primary means of manifesting his points was via the use of animal analogies. 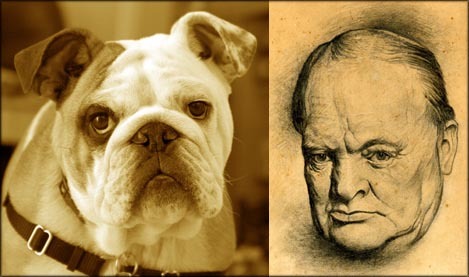 (In this connection, it is funny to recapture Churchill's famous nickname provided by the Russians, The British Bulldog). Winston Churchill was not exactly a modest man. He was very well aware of his talents and powers and he was convinced that he was destined to do great things. This is why he in metaphorical terms speaks of himself as being 'only' a human being but one that shines more brightly than many others. 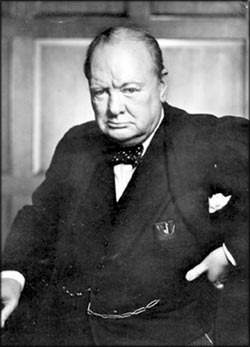 Winston Churchill's avid fascination with political and military history and his marvellous grasp on the written word led to his 3 famous and massive works: The World Crisis (about The First World War) The Second World War and A History of the English-Speaking Peoples. 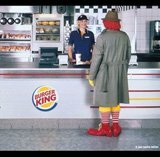 In critical and baffling situations, it is always best to return to first principle and simple action. What made Winston Churchill such a good strategist was not only his ability to look into the future but just as much his ability to decipher patterns of the past and ... most importantly to ACT in the Now. His success is probably more due to efficient action rather than successful prediction. Not only is Winston Churchill famous for his war quotes about victory and courage and his political quotes regarding e.g. democracy, he is also famous for his general words of wisdom. Yes, this sarcastic but funny quote is so true and very typical of Churchill's spirit of perseverance. No matter how tough things may seem, keep on going. Don't stop! Here is the last mixed batch of our big collection of quotes by Winston Churchill.